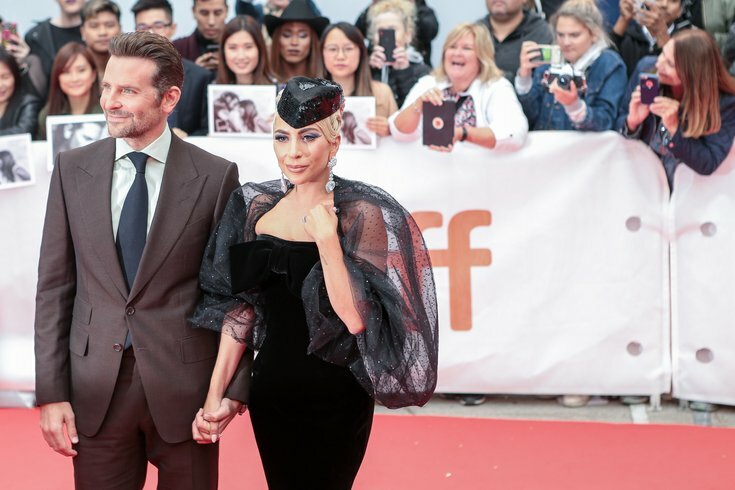 Bradley Cooper and Lady Gaga are seen a file photo attending the 'A Star Is Born' screening during the Toronto International Film Festival. 'A Star is Born' has been nominated for a 2019 Golden Globe award for best motion picture, and Cooper and Lady Gaga are nominated for best lead actor and actress, respectively. Bradley Cooper, a Jenkintown native who is randomly fluent in French, is visiting Philadelphia for a very secretive showing of his new film "A Star is Born," which doesn't hit theaters until Oct. 5. The film is a hotly anticipated remake of the 1937 film that already was famously remade starring Barbara Streisand opposite Kris Kristofferson in 1976. It will also mark the film debut of one Lady Gaga. The movie trailer premiered in June. The film, which Cooper also directed and co-wrote the screenplay, has been receiving positive feedback on the festival circuit. Though it's still early, it currently has a 94 percent rating on Rotten Tomatoes (taken from 45 reviews) and received 3.5/4 stars from Roger Ebert. Some are even suggesting that this could lead to an Oscar for Lady Gaga. The singer earned acting accolades, including a Golden Globe, for her role in "American Horror Story: Hotel." Now some lucky folks in Philly could get a chance to see the movie a few weeks early. Cooper will be in town Wednesday, Sept. 12, for an advance screening of "A Star Is Born" at a currently top-0secret location. Though the event is private, Q102 is still giving away tickets to fortuitous contest winners. Though nothing is confirmed, it's of course possible that Lady Gaga could surprise viewers and appear at the screening, too –º the pair has been doing a lot of film press alongside each other.